Let me take you back to the spring of 2003 when I was in my final months of high school. One of the “senior privileges” my school offered was that we were allowed to leave campus during our study hall periods. Well, none of my friends had study hall with me and I most certainly didn’t want to stay in school for that afternoon period. So I made a daily routine for myself. First, I’d walk on over to the nearby 7-Eleven to buy myself a Slupree. While I was there, I would check their magazine rack to see if the latest Raijin Comics issue had come out. If there was a new issue, I’d buy it. I would then take said Slurpee and magazine to an outside bench, take a comfortable seat, and then spend the remainder of the period reading the manga and drinking the cool drink on that warm spring afternoon. It was a great way to get through that last semester of my secondary education. Raijin Comics was a weekly – let me repeat that – weekly manga anthology produced by newcomer Gutsoon! Entertainment that had started in December 2002. It launched at the same time Shonen Jump USA launched, but Raijin was clearly going for a more mature audience with a wider variety of titles. 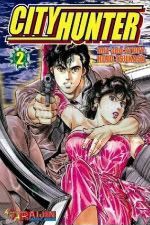 This included some old shounen classics like comedy-adventure City Hunter, the extremely violent Fist of the North Star and Grappler Baki, and the popular sports manga Slam Dunk. 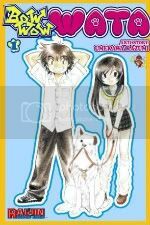 But mixed in with these older titles were a couple of newer comics like the harem comedy Guardian Angel Getten, the political drama First President of Japan, and the absolutely adorable talking animal comic Bow Wow Wata. I loved Raijin to death, and like I said, reading the magazine had become a ritual for me during my first years of otaku fandom. There would be a new chapter of each series for me to read every week. I immediately picked out my favorites, like City Hunter and Bow Wow Wata, and even bought the tankoubon (graphic novel) of these series when they finally came out in that format. But I also had a couple of series I didn’t really enjoy, like First President of Japan, and would always skip through them each volume. When you have a manga anthology with that kind of variety, you can choose what to read and what to skip. However, the weekly anthology just couldn’t sell enough copies in America to make it. By fall of 2003, it switched over to monthly format to try to gain more readership, but it was too late. In summer of 2004, both Raijin Comics and its publisher Gutsoon! just disappeared from the American market. Many of the magazine’s series were halted at that point. Slam Dunk never even saw the ending to its first major story arc. And of course, I was devastated over the loss. Not only would I never get to read any more chapters of City Hunter or Bow Wow Wata, but I no longer had an awesome manga anthology that was made for my demographic. Shonen Jump was too young for me and I don’t care much for the series of Shojo Beat either. I had to settle for periodically buying Japanese anthologies like Young Animal or Champion Red, but they just didn’t fill the void that Raijin had left. Now let’s go forward into today’s manga market. It has been four years since the final issue of Raijin, but its collapse is still felt within the industry. No other major manga company besides Viz would even considering putting out a manga anthology in the US. Tokyopop and Del Rey were well aware of the failure of Raijin, and no matter how many times fans would ask them for one, they knew that such a manga anthology would never be successful in America. And so they continued to only release tankoubun in our market for all these years. And then along comes newcomer by the name of Yen Press to challenge this idea. During their industry panel at the New York Anime Festival last year, the year-old company announced that it would be releasing a new monthly anthology called Yen Plus. They followed up this announcement at the New York Comic Con last April by talking about their partnership Square Enix to bring some popular Japanese titles to the magazine along with some new OEL and Korean titles. As I had written in my NYCC convention report, this company completely blew me away with this manga anthology idea. Could this be the return of a magazine like Raijin Comics to the US? Well, as I found out in late July of this year, that answer was yes. Yen Plus is the rebirth of Raijin… and maybe even better. There have been many reviews out about the publication already, so I’m not going to give you a series-by-series rundown. Instead, let me just say that like Raijin, there are some series that I absolutely love and others that I didn’t really care much for. But that was the best thing about Raijin, you have enough variety and content in each issue that you don’t feel cheated that you don’t like everything. There’s plenty there to offer to anyone. The one series that I have fell head over heals for is this Korean comic called Pig Bride. This cute fairytale-meets-real-life story was a very pleasant surprise when I came across it in the first volume. When I received the second issue, I immediately flipped to that month’s episode of Pig Bride and devoured it within minutes. It went by so quickly that I am now begging for the next issue to come out so that I can do the exact same thing all over again next month. That is the kind of fun one experiences when a comic is serialized in an anthology like this. So wait… Am I saying that the best series in a Japanese-style manga magazine is actually Korean? Yup, and I think that this is the biggest selling point for Yen Plus. Yen Plus divides its magazine into two sides. 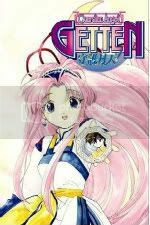 Side A, read from left-to-right, features Korean and OEL manga titles. 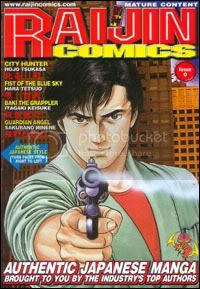 Side B, read from right-to-left, features all the Japanese comics. This is completely different from Raijin or any of Viz’s American anthologies because those magazines only ran Japanese titles. However, I found the Korean / OEL Side A to be much more entertaining than the Japanese Side B. Maybe it is a sign of wanting something a little different, but I felt the Japanese titles were very tired and cliched. On the other hand, the Side A titles offered a new art style in the OEL titles and a new foreign culture with the Korean titles. Sure, I might have to brush up on my Hangul again to read the sound effects for the Korean titles, but even that is very refreshing after so many years of reading Japanese sound effects. It is also a brilliant way of getting more attention for Yen Press’s highly profitable OEL titles. As I wrote in this essay, Tokyopop’s biggest problem recently was that their OEL series just didn’t sell. No matter how much advertisement money they put into promoting their lineup, American otaku don’t want left-to-right comics, they wanted the exotic right-to-left Japanese comics. So I believe that Yen Press is doing a great bit of promotion by including their OEL titles with the Japanese titles. In Yen Plus magazine, you’ll come for Japanese titles like Soul Eater and Bamboo Blade, but you’ll stay for the OEL series like Maximum Ride and Nightschool. I think that with this strategy, Yen Press’s OEL lineup will have a much larger readership and fanbase than Tokyopop’s did. Can it succeed? Can Yen Plus actually last longer than Raijin? Well, I think the odds are still stacked against it. Sure, one of Raijin’s biggest problem was that it was a weekly release, so few fans were willing to pay for a new issue every week. By being released monthly, Yen Plus is not putting such a financial strain on its readers. Not to mention that both of Viz’s monthly anthologies have been running smoothly for years now. But unlike Viz, Yen Press is not a huge company in the US market yet. They don’t have huge mainstream titles to fall back on if the magazine tanks – although Haruhi Suzumiya might change that in the near future. Manga anthologies are risky, and larger companies like Tokyopop and Del Rey have specifically stayed clear of them for that very reason. Magazines will go away if people do not read them, which ADV has shown recently with the fall of Newtype and Piq in the past year. So will Yen Plus make it in a market that crushed Raijin in the past? I don’t know… but man, I’m sure as hell cheering them on. I find myself loving Yen Plus as much as I loved Raijin, and reading this new magazine is taking me back to 2003. I think Yen Plus even has that same mossy smell as its predecessor. It is this the answer to the prayer that this American otaku has been making for the past four years, and I couldn’t have asked for anything better. If you are an older manga fan looking for a little variety in your reading, then you must pick up an issue right now at your bookstore, or order a subscription from the Yen Press website. NOTE: Two titles that used to be in Raijin Comics, Slam Dunk and Guardian Angel Getten, have been re-licensed by Viz and Tokyopop respectively and have began publication in America once again. All other Raijin series have remained out of print since 2004. This entry was posted on Wednesday, September 24th, 2008 at 3:14 pm by Scott	.